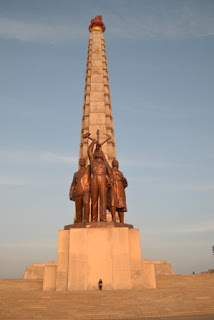 Juche Monument, Pyongyang, North Korea (aka DPRK) with a human standing in front, for scale. There should be an index that measures the size of national monuments. I can't help but speculate that the larger a nation's monuments, the more authoritarian is the state. 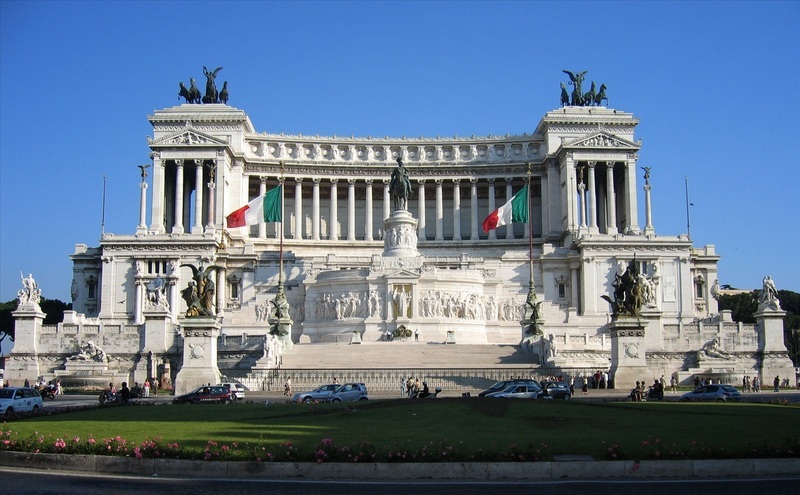 I think of the pyramids, and the monument to Vittorio Emanuele II in Rome. Perhaps there are other, stronger, correlations. Maybe the larger monuments indicate a stronger state elite (elites who build things to impress the masses with their power, and to get the masses to be "proud" of the state--i.e., the elite). And maybe this is all too crude. After all, the US seems to have had its peak of monument building well before its recent peak of centralized power. The biggest monuments in DC arethe Washington Monument (built between 1848-1885) and the Lincoln Memorial (1914-1922). The DPRK is sociologically fascinating. Social scientists spend much of their time showing that people's choices are shaped by the culture and society (well, except for economists, who still believe in the autonomous individual). When we face a society where choices are really constrained, like the DPRK, then we are forced to recognize that choice is, in fact, important in most modern societies. Yes, all societies limit our choices and mold us in certain ways. But the DPRK is at an extreme. The task of combining structure and agency is never easy, and new terms such as "structuration" don't help much, except to highlight the challenge. Every society is weird in some way. The DPRK's weirdness forces anyone who dismisses choice and markets as not important to recognize that freedom to choose actually does matter. It is an exotic culture of our time that shows the limits of what humans can bear and do, a fascinating example, and one in the end that highlights why some level of individual freedom is in fact necessary and desirable.